So can knives both be thrown and used for stabbing? I'm guessing you can't throw the halberd. The stabbing knife and the throwing knife are different knives. Totally different items. Also, hard to show a good example picture, but I recently worked on npc's. Oh yes, I see the item graphics are different. A bit odd though. It would be clearer if it didn't say x1 next to the non-thrown items, which seems to indicate that they are expendable. Yes I plan on changing that. I just haven't decided between an infinity symbol, a dash, or simply a blank space. Ooo, the clouds pass by, right? Anything else of interest on the title screen? 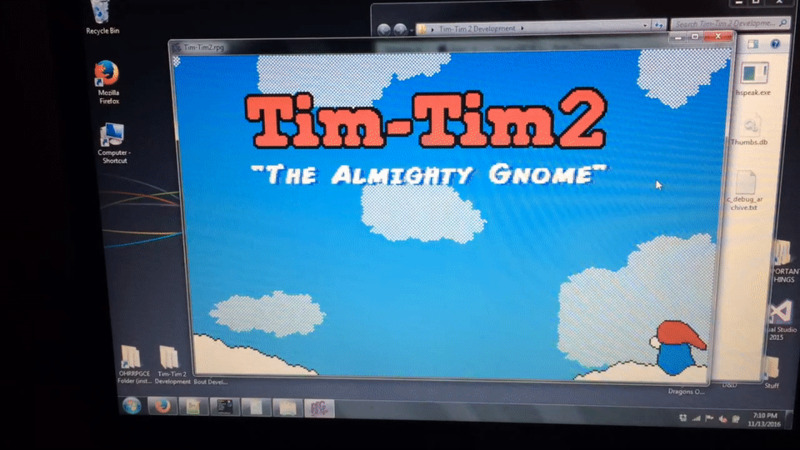 tim-tim animates, but no that's about it. Looks great! Is Tim-Tim meant to be falling out of the sky? Only dropping a couple tiles doesn't give that impression. What are those coins falling from the sky? Things that fell out of Tim-Tim's pocket as he tumbled out of the sky? Reminds me of Seiklus... (it turns out there's an easter egg on the title screen which I didn't know about). Can't wait till this hits steam. Happy to playtest for you!